Any time you apply a chemical substance to your body, be it hand lotion, shaving cream or underarm antiperspirant, you run the risk of exposure to potentially harmful toxins. In the case of antiperspirant, one of the main “chemicals” of concern is aluminum (which is actually a heavy metal, not a chemical). Aluminum is the active ingredient in most antiperspirants. It forms a temporary “plug” in your sweat duct that reduces sweating, keeping you drier (and less likely to have offensive underarm odor). Research has suggested, however, that applying these aluminum-based compounds to your underarms in the long term may be problematic. Clinical studies show a disproportionately high incidence of breast cancer in the upper outer quadrant of the breast together with reports of genomic instability in that area, which suggests locally applied cosmetic chemicals may play a role in the development of breast cancer. Aluminum is known to have a genotoxic profile, capable of causing both DNA alterations and epigenetic effects, and this would be consistent with a potential role in breast cancer if such effects occurred in breast cells. Estrogen is a well-established influence in breast cancer; aluminum in the form of aluminum chloride or aluminum chlorhydrate can interfere with the function of estrogen receptors of human breast cancer cells. In short, although a definitive connection hasn’t been proven, it is possible that aluminum’s ability to cause estrogen-like hormonal effects may contribute to the development of breast cancer. While aluminum is typically only found in antiperspirants (not deodorants), parabens are often found in both. These chemicals, which are used as preservatives, also mimic the activity of estrogen in your body. Research published in 2004 found parabens in 18 of 20 tissue samples from human breast tumors. Separate research also found parabens in 99 percent of breast tissue samples collected from 40 mastectomies for primary breast cancer. While a definitive connection hasn’t been proven, there’s concern that daily use of antiperspirant, deodorant and other paraben-containing personal care products may play a role in breast cancer. Potential cancer risks aside, there are other ramifications of daily antiperspirant use that are only beginning to be understood. One small study revealed that antiperspirant and deodorant use alters the microbial community under your arms. Further, antiperspirant usage led to an increase in Actinobacteria, which may contribute to body odor. In other words, using antiperspirant may stimulate odor-producing bacteria, possibly because the aluminum kills off the less odor-causing bacteria and allows the more odorous bacteria to thrive. Click HERE for more ideas on how to treat bad body odor. If you choose to use antiperspirant, you probably apply it in the morning (as do most people). However, you’re actually better off applying it at night before bed, as this is when your sweating rate is naturally decreased. 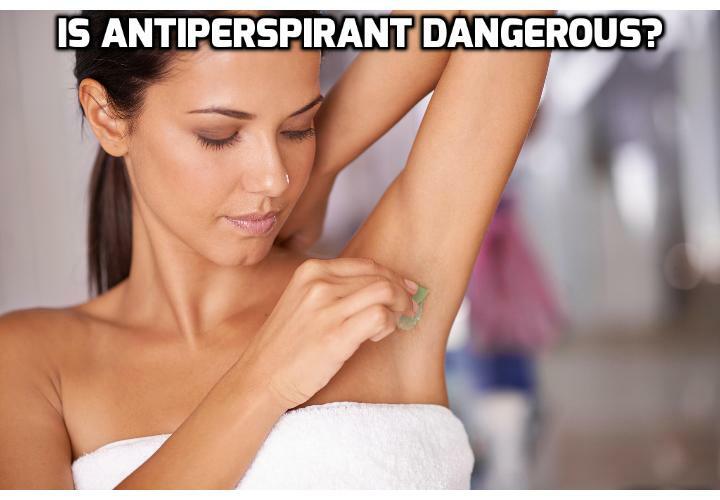 If you apply antiperspirant in the morning, the antiperspirant “plugs” will have to battle with sweat and moisture, whereas at night they’re able to easily plug up your ducts for better protection. For the ultimate protection, some dermatologists recommend applying antiperspirants both before bed and again in the morning, but unless you have a serious sweating problem this may be a bit of overkill (and will increase your chemical and aluminum exposures significantly). This all-natural formula combines the very latest research and clinical studies in digestive health with centuries of traditional healing wisdom into a natural product that gently releases and flushes toxins from your colon. Natural Cleanse contains herbal remedies like buckthorn bark, ginger root, and milk thistle extract combined with psyllium husk and a patented probiotic blend that helps rebalance your vital gut microflora and supports healthy detoxification – and it is clinically proven to improve digestive function.